Lee Arnold, PhD (1912-2009), who chaired the Guggenheim School of Aeronautics at New York University, devoted thirty-plus years to studying the physical phenomenon of flutter – the force at the heart of ResHydro's Hydrofoil Cascade Resonator (HCR) technology. Dr. Arnold had been engaged in analyzing and solving the issue of the destructive force of aeroelastic flutter, until now known primarily for tearing apart aircraft, bridges and other structures. He realized through his work, however, that this enormously powerful force could potentially be harnessed and used to generate electricity from a fluid flow (water or air). To read more about Dr. Lee Arnold, click here. Dr. Lee Arnold was former chairman of the Guggenheim School of Aeronautics at NYU, and was a longtime associate and partner of Dr. Theodore Von Karman, who is considered the father of modern vortex theory. Dr. Arnold originally conceived of the idea of generating power from flutter while working at Glenn L. Martin Co., as part of the Vibration and Flutter Group. He went on to head the Aeroelastic Group while at Republic Aviation, followed by work as an Engine Vibration Consultant to United Aircraft/Pratt & Whitney. During this time, Dr. Arnold formulated his theory into an applicable format, and in the 1980s Dr. Arnold and his scientific team began work on the HCR in earnest. Dr. Arnold's design was granted its first US Patent in January, 1980, and in 1990 a prototype was built and tested in air at NASA's Langley Research Laboratory. This test marked the first time that electricity had been generated from flutter. University Appointments include: Columbia University, Professor of Civil Engineering (Flight Structures), 1953-1958; New York University, Chairman and Professor of Aeronautics and Astronautics, 1958-1973; Guggenheim School of Aeronautics, Director, Emeritus Professor of Applied Science. Dr. Arnold received his BA from Duke University with Honors in Mathematics and Physics, a Master's in Mechanical Engineering and Aeronautics from the California Institute of Technology, and his PhD in Applied Mechanics from Columbia University. The mechanical proof of concept previously tested at the National Resource Council (NRC) in Ottawa, Canada. Dr. Arnold's design was granted its first US Patent in January 1980. In 1990, with support of a grant from NASA, a wind powered HCR prototype was successfully tested at NASA's Langley Research Laboratory. This test marked the first time that electricity had been generated from flutter. Dr. Arnold further conjectured that flutter could be made to occur in all fluids, including water, which would generate greater amounts of electricity given that water is over 800 times denser than air, thereby allowing for smaller power plants to generate great amounts of power. His theory was widely dismissed by the leading hydroelectric experts of the time, until Dr. Arnold and his colleagues built a mechanical proof-of-concept model and tested it at the National Research Council Hydraulics Laboratory in Ottawa in 2000. This test proved conclusively that flutter could be made to occur in water, and that the HCR was capable of continuously extracting a substantial amount of electric power from flowing water. After the 2000 proof of concept test, Dr. Arnold's colleagues, led by physicist and longtime associate Colin Kerr, developed and patented a commercial HCR system. Equipped with a new hydraulic power transmission, this version maintains flutter at all water conditions and facilitate the conversion of hydrofoil oscillation into utility-grade electricity. This development propelled ResHydro along the path to commercialization. Reshydro contracted with Creare Inc. in 2011 to produce a "Fluid Dynamic Analysis and Design" of the HRC, delivered in 2012. Creare is a highly respected Engineering, Research and Development organization located in Hanover,NH. ResHydro's relationship with Creare dates from 2006. This preliminary project, using the Fluent CFD (computational fluid dynamics) program, resulted in the development of a unique approach to the CFD analysis of the HCR using a circular mesh embedded in a linear mesh, to simultaneously model both rotational and lateral motion of the hydrofoils. Creare's CFD results provided independent verification of the validity of the observed efficiency of the mechanical proof-of-concept HCR model tested at NRC in 2000. 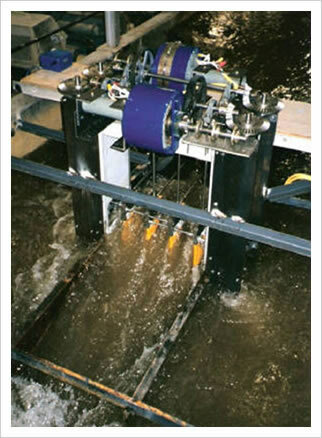 Creare also carried out a prototype design program in 2011, and in 2012 a further contract resulted in a towing tank model using programmable servomotors to simulate oscillatory motion of hydrofoils in water, tested at the Kelvin Hydraulics Laboratory in Glasgow, Scotland, in August 2013. We have since secured our initial target investment and are moving forward with the development of the commercial HCR - A pilot-scale system to be designed, fabricated and tested in natural flow conditions. The CFD models will be used to scale up and optimize the HCR for utility-scale systems. We will develop numerical models for HCR performance based on the fundamental physics that govern the interaction of the flowing water and oscillating hydrofoils. To read more about Computational Fluid Dynamics, click here. Computational Fluid Dynamics (CFD) is the use of numerical and finite element analysis to analyze and solve fluid mechanics and flow problems with multiple variables, boundary conditions and dimensions. Using high-speed, high capacity computers, and algorithms, we will model and optimize the HCR technology to levels of fidelity and accuracy that were never before possible using manual methods.